There is only so much time in a day for teachers and instructional coaches, and with emails, meetings, and traveling, the time to actually meet with teachers is whittled down. So what are some tricks to coaching teachers long-distance? Have you thought about virtual coaching to need your teachers consistently and in a timely fashion? 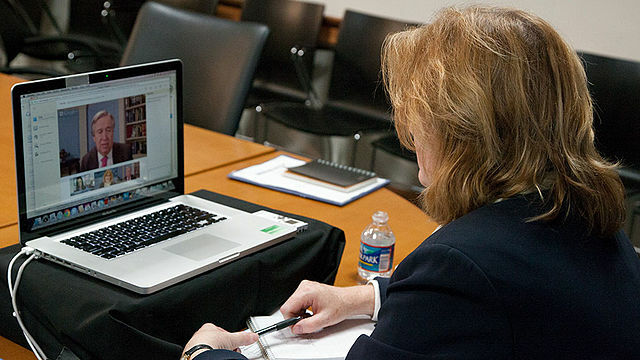 Using the tech tools to coach teachers virtually makes perfect sense. The most obvious tool is Google Hangout to meet with teachers without having to travel to see them. Scheduling your time and sticking to it is going to be the most important factor. If the person isn’t at her desk to pick up, the meeting will never happen. For this, I recommend getting the teacher’s number to text her to make sure she is ready for the hangout. You have to find a quiet place to hold the hangout. If you have an office, you’re all set. However, if you travel among multiple schools, Starbucks and Barnes & Noble probably wouldn’t work. Instead, try to schedule an empty conference room in the office or media center. The first few Hangouts are a little awkward; neither one of you wants to see your own face or hear your own voice. But don’t let that stop you. After a while, you will both get used to it and will figure out what works best for you. A second simple way to coach teachers virtually is to register in their Google Classrooms as a student and stalk them (not in a weird way). Do NOT turn off your notifications. 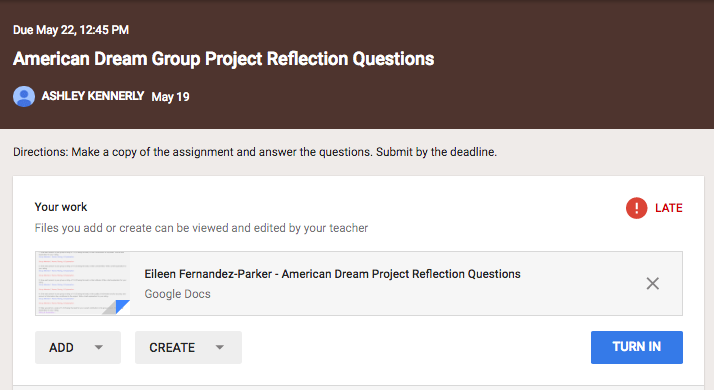 Yes, your inbox will fill quickly as teachers use Classroom more and more; however, you have a birds-eye view of all of the activities teachers are doing via Classroom. As you see the titles pop up in your inbox, click on the ones that catch your attention. Dig in, and read the directions. What better way is there to evaluate an activity. You can quickly see where it falls on the SAMR scale, whether it encourages the 4 Cs, whether it incorporates authentic learning, blogging, encourages innovation, etc. 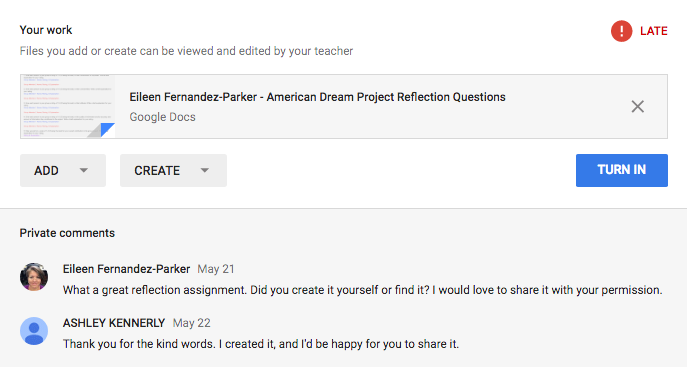 I use Classroom to communicate directly with the teachers by posting a private comment right in the assignment window. It’s fast and direct. If it is something that might help another teacher, I ask permission to share the idea. Most teachers are so thrilled and flattered that something they created is good enough to share; I have yet to be denied the request. Here is an example of a reflection exercise posted by one of my teachers in her English 3 classroom. As you can see, I posted a comment reflecting how impressed I was and asking for permission to share it. She communicated right in the same window. You can see from her response that she was flattered by the compliment and that she gave me permission to share it out. As a coach, building relationships is foundational, so be careful only to post positive remarks. Can you imagine how uplifting it would be to get an unsolicited, positive comment about one of your activities in your inbox? You can also use your positive comments as a reason to meet. What teacher does not want to spend a little time with someone with good things to say who builds them up. At the same time, can you imagine how blindsided you would feel if a coach left a negative comment in your Classroom? If someone did that to me, I would remove her immediately from my Classroom roster. If you see something that concerns you, save it for your in-person discussions. As things get more and more busy with your schedule and theirs, be creative in ways to reach your teachers. Coaching teachers virtually some of the time is a win-win situation.